To celebrate the UK release of THE EXPENDABLES 2 this Thursday, 16th August, from Lionsgate UK, Big Ideas Digital is running a limited offer with their hugely popular mobile app game Say What You See: The Collection™ to give users free access to their popular Action Movies canvas. 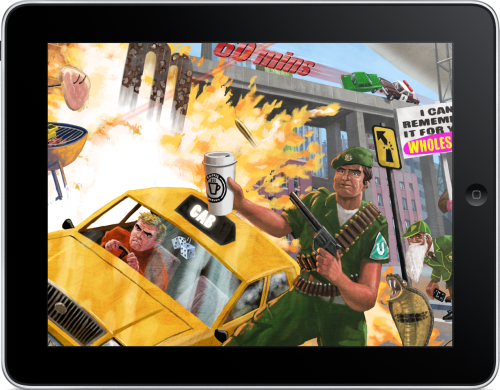 Featuring hidden objects that relate to a host of films from the extensive action-packed back catalogue of the film’s cast, which includes Sylvester Stallone, Jason Statham, Arnold Schwarzenegger, Bruce Willis, Dolph Lundgren and Jean-Claude Van Damme, the Action Movies iCanvas is part of the recently released Say What You See: The Collection™. Created by Big Ideas Digital, Say What You See™ is a hidden object game in the style of Where's Wally?, but with a cryptic twist - once you’ve scoured each oil painting (or iCanvas) for objects, you’ll have to unravel their meaning too. The company’s second release, Say What You See: The Collection™ is an access-all-areas pass to puzzling pleasure that includes a built-in hints system and full Game Center compatibility, so you can compare scores and earn achievements. 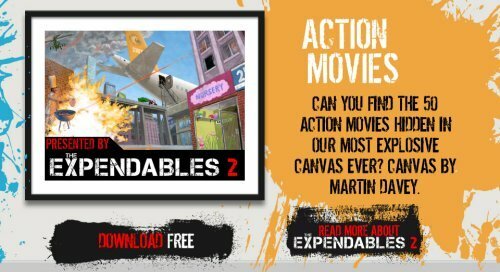 The limited offer Action Movies puzzle canvas can be accessed from swysapp.com or the App Store. The Expendables 2 will be hitting UK cinemas from August 16, 2012.